Most people assume that drugs are our most potent weapon against disease but, when it comes to lyme disease, a recent study suggests otherwise. The study conducted by scientists at the Department of Molecular Microbiology and Immunology at the Johns Hopkins Bloomberg School of Public Health in Baltimore, Maryland, found that certain essential oils were more powerful in the treatment of lyme disease than the standard antibiotic treatment. The study, published in the medical journal Antibiotics, found that 10 of the 35 essential oils tested in laboratory dishes demonstrated “strong activity” against the latent, “persister” forms of lyme disease. The oils include: garlic, myrrh, thyme, cinnamon, allspice, cumin, eucalyptus, litsea, lemongrass and spiked ginger lily. Persister forms of lyme disease are considered to be those in the 10 to 20 percent range that do not respond to the standard antibiotic treatment, and which can be particularly challenging to those dealing with the condition. Even in concentrations of 1 part to 1000, which is considered a low dose, several of the essential oils completely destroyed the bacteria behind the disease in only 7 days. What’s more: there was no bacterial regrowth with these essential oils after 21 days. These powerful essential oils include: garlic, allspice, myrrh, hydacheim (spiked ginger lily) and litsea (also known as may chang). That’s great news for the estimated 300,000 people diagnosed with lyme disease, with about 30,000 cases reported each year. Lyme disease is a debilitating disease that medical experts believe to be caused by the bacterial infection B. burgdorferi linked to tick bites. Some of the symptoms of lyme disease include: rashes (including the signature rash that looks like a bulls-eye), fatigue, achy or swollen joints, headaches, dizziness, fever, night sweats, sleep disturbances, cognitive decline, sensitivity to light, coordination problems, heart inflammation, anxiety, depression, chest pain, jaw pain and other unexplained pain. An earlier study, published in Frontiers in Medicine, confirmed the efficacy of essential oils against lyme disease. In that study, researchers found oils of oregano, clove and cinnamon were highly effective against the infection. The results, which “completely eradicated all viable (bacterial) cells” were believed to be as a result of such naturally-occurring compounds as carvacrol in oregano. Carvacrol has been shown in many studies to be anti-infectious against bacteria. Pure essential oils are among the most powerful antibiotics available and the new study published in the medical journal Antibiotics supports their use against the bacteria behind lyme disease (Borrelia burgdorferi). 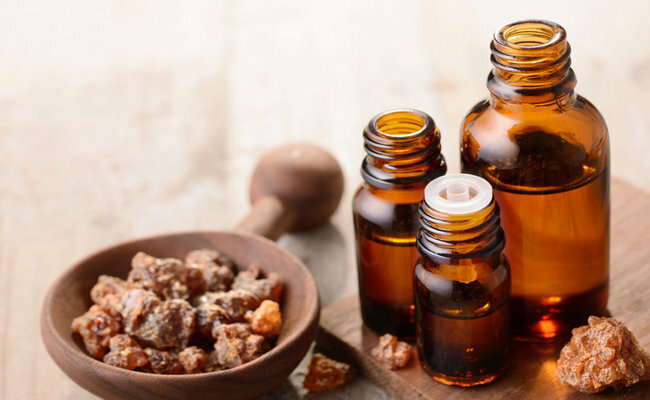 I’ll share the new research and the essential oils which had the greatest effectiveness against the bacteria, including: thyme, myrrh, cinnamon and others. The Johns Hopkins team of researchers intends to conduct additional tests to determine whether the cell culture study results will translate into clinical results. While the results are not yet conclusive, you may wish to use essential oils for the treatment of lyme disease. There are many ways to use essential oils, including diffusing them or mixing them with water and spraying into the air for the purpose of inhalation, applying topically or ingesting. In my more than 25 years’ experience as an aromatherapist, I have found that ingestion of one or more of the above oils tends to yield the best effects for infections and lyme disease. However, not all oils are suitable for ingestion. Actually, most of the oils on the market are not. So, use only oils that clearly indicate their suitability for internal use. This is easily identifiable on the label, which would indicate “dose.” If a “dose” amount is not indicated, the oil is not suitable for internal use. Most of the above oils are extremely strong and should be diluted before using. Additionally, you should work with a qualified natural health expert before ingesting any essential oils. Make sure you select high quality, pure, undiluted essential oils. While you may end up diluting the oils yourself, most of the oils on the market are diluted in less-than-desirable oils. High quality oils cost more than the cheap varieties on the market but are worth the increased price. Many cheap varieties can also contain synthetic versions of the oils, which offer no therapeutic value and may actually be harmful. But, worse than that, many cheap oils are adulterated with solvents used during the extraction process or toxic pesticides used in the growing process of the herbs from which the oils are extracted. After diluting the oil in carrier oil, always conduct a 48-hour patch test on a small inconspicuous part of your skin to determine whether you have any sensitivity to the essential oils. Do not discontinue any prescribed medications without the guidance of your physician. Use essential oils with caution and the advice of a qualified natural health practitioner during pregnancy or in the treatment of any health condition. Dr. Michelle Schoffro Cook, PhD, DNM is the publisher of the free e-newsletter World’s Healthiest News, founder of Scentsational Wellness, co-founder of BestPlaceinCanada, and an international best-selling and 20-time published book author whose works include: Cancer-Proof: All Natural Solutions for Cancer Prevention and Healing. Follow her work. tks very much for posting this article.